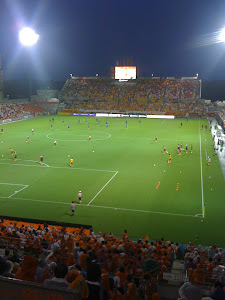 Omiya Ardija went into this home game on the back of a thrashing by league leaders Vegalta Sendai. For our next opponents we would have liked an easier proposition than last year's runner up and many people's favorites for this season's title, Nagoya Grampus but that was the wonderful prospect the computer had thrown up. The result therefore must be seen as a good result for the Squirrels even if it meant that our search for a home win goes on (and on???) The first half ended 0-0 and all the goals would come in a 7 minute burst in the second half. Nagoya opened the scoring on 48 minutes through Danilson. Nagoya were able to build an attack on the left side of Omiya's box, they quickly moved the ball about and as we were unable to put in a decent tackle, the ball was laid back to Danilson and he struck the ball home from outside the penalty box. Seemingly Kitano was well beaten but could he have done better fans will ask. And it was yet another goal conceded at home from outside the penalty box. Admittedly Yokohama's in the Nabisco Cup had an element of luck but it could be seen as a worrying trend if teams start to think they can score from distance where against other teams they might not expect to. Our goal came on the 55th minute. Cho made a forward run and took a shot at goal which was missing the target but Kanakubo had got ahead of his marker on the right side of the Nagoya six yard box and finished neatly. Omiya Ardija survived some late Grampus pressure and a valuable point was secured. Again, the value of Cho and Carlinhos to the team was shown and the re-introduction of Jun Kanakubointo the starting lineup clearly worked well here. Next up in the league is a home game against Cerezo Osaka. Let's hope as the Cherry Blossom comes into full bloom in Omiya Park, we can send those Cherry blossoms from Cerezo back to Kansai pointless and wishing they'd stayed at home for Hanami.